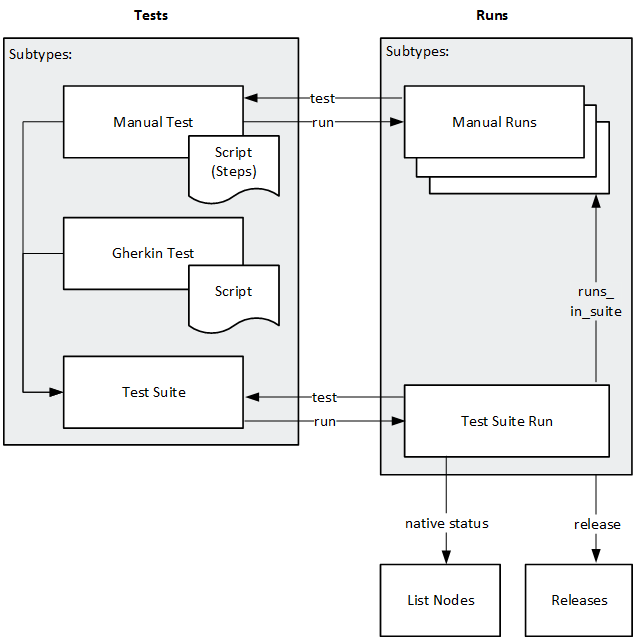 This flow demonstrates how to use the REST API to plan a test suite run. We need to access the following entities for this flow, and understand the relationships between these entities. The manual test is a subtype of the tests aggregate resource collection. The manual test can also be accessed in the manual_tests resource collection. There is no field that relates back to the aggregate resource collection, tests. Manual test steps are stored in the ALM Octane internal repository. Steps are accessed as a script resource under the corresponding test in the tests resource collection. The Gherkin test is a subtype of the tests aggregate resource collection. The Gherkin test can also be accessed in the gherkin_tests resource collection. Gherkin test scripts are stored in the ALM Octane internal repository. Scripts are accessed as a script resource under the corresponding test in the tests resource collection. The test suite run is a subtype of the runs aggregate resource collection. The test suite run can also be accessed in the suite_run resource collection. There is no field that relates back to the aggregate resource collection, runs. Manual test runs that are associated with the test suite run are accessed using the array runs_in_suite. The array contains the IDs of associated tests and their run type (such as run_manual). Runs can be associated with releases. Using the tests created in the Create a test suite with manual and Gherkin tests flow, we create a test suite run. The name (MyTestSuiteRun) and ID (1067) of the test suite we are "running." The native status we want to assign to the run. Statuses are accessed in the list_node resource collection. In this flow, we will assign status 1095, which corresponds to list_node.run_native_status.planned. The release associated with the planned test suite run. The test suite run is created with ID 1196.